Be the first to share your favorite memory, photo or story of Alonzo James . This memorial page is dedicated for family, friends and future generations to celebrate the life of their loved one. 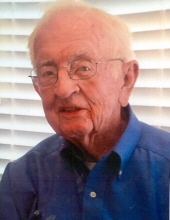 Alonzo James Davis III, life-time resident and surveyor of Wayne County, died February 4 at the age of 93. He spent his life in dedication to his wife Jean for 71 years and family, serving God and his country, and working hard. At age 11 he worked at the Pickle Plant capping strawberries, then at 12 he started working in the family hardware store. At the age of 16, he surveyed Seymour Johnson Air Force base. After a few years of college, he enlisted in the US Navy during WWII. He served in the Pacific Theater. He became quarter master of his LST and navigated the ship to Naqasaki, Japan. After the war, he married Jean and farmed for awhile. Later he worked for the Corp of Engineers where he helped survey to lower the bottom of the Cape Fear River, which opened up shipping lanes. After working for Ed Little, he opened his own business in Kinston, "Jimmy Davis Land Surveyor," He served as vice president and then president of the North Carolina Society of Surveyors. Later he moved his business to Mt. Olive. He was honored in 2012 as the oldest active surveyor. During his life he was a Boy Scout Master. He was a member of the VFW. When he lived at Rones Chapel, he was Choir Director for Rones Chapel Methodist Church. When he moved the family into town, he served the First United Methodist Church as lay leader and taught Sunday School for over 47 years. He held the office of District Lay Leader in the North Carolina Conference and held the office of Conference Lay Leader. He was preceded in death by his parents, Margaret Francis Wheeler Davis and Alonzo James Davis, Jr.; a sister, Jacqueline Mooring and her husband, Dr. Stewart Mooring; and a brother, William Davis and his wife, Beverette Davis. Surviving him are his wife, Jean Chaplin Davis; children, Dr. Lon Davis IV and wife, Phyllis, of Morehead City; Elaine D. Shipley and husband, Mike, of Mount Olive, and Rebecca D. Jones of Goldsboro; grandchildren, Alonzo James Davis IV and wife, Velma, Adrian Skibinski and husband, Thomas, Amy Davis, Amber Price, Candice Coulter and husband, Jim, Caroline Jones, Matthew Jones, Alyssa Jones, P. J. Hall and husband, Brad, and John Frick; and 11 great-grandchildren. In lieu of flowers, donations to First United Methodist Church, PO Box 420, Mt. Olive, N.C.
Visitation will be held at Tyndall Funeral Home on Wednesday from 6:00 p.m. until 8:00 p.m.
A graveside service will be held at Maplewood Cemetery at 11:00 a.m. Thursday. To send flowers or a remembrance gift to the family of Alonzo James "Jimmy" Davis III, please visit our Tribute Store. "Email Address" would like to share the life celebration of Alonzo James "Jimmy" Davis III. Click on the "link" to go to share a favorite memory or leave a condolence message for the family.